Here are the last projections for this year’s NCAA Men’s Basketball tournament using these same Sagarin rankings for the field of 68 teams. This is the final projection for the Field of 68 schools before the actual field is announced later tonight. There are still six conference championship games yet to be played today with the Ivy League, Atlantic 10 and Sun Belt likely to just get their champions in the field. For the other three conferences, both teams are already projected in the field. For each of these remaining six conferences, the higher ranked team in the Sagarin rankings of the two yet playing was placed in this projection as the conference champion, however. The following are the 32 Division I conference champions or projected champions. The ones highlighted in YELLOW are what we categorize as Mid-Major conferences. The ones highlighted in GREEN are ones we categorize as High-Major conferences. 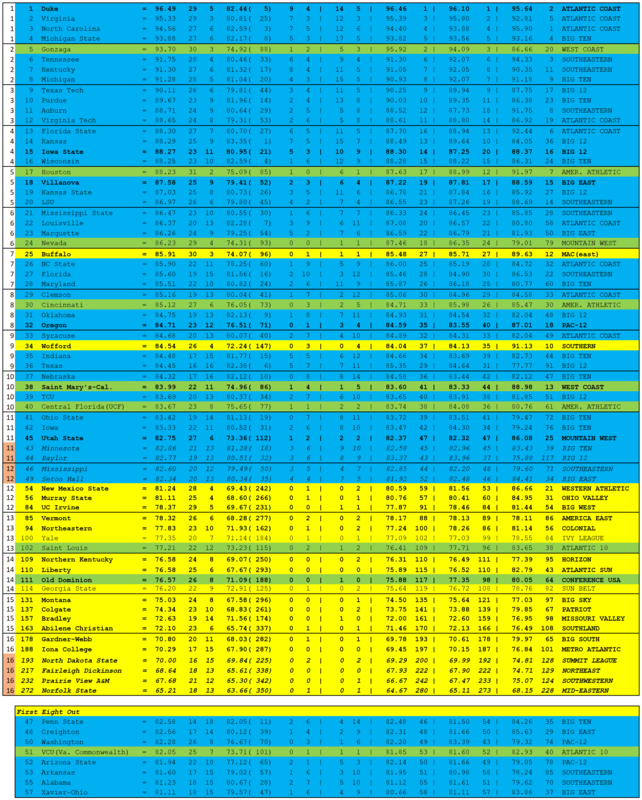 And the ones highlighted in BLUE are ones we categorize as Major conferences. The ones in bold have won their respective conference tournaments. Each of the seeds are highlighted for the four regions with the exception of the #11, #12, and #16 seeds, which have five teams for the #11 and #12 and six for the #16 seeds. These seeds are projections that would play in the First Four games. The eight First Four teams are highlighted on the left in ORANGE and in italics. These teams are the last four at-large teams and the last four automatic qualifying teams. NOTE: Penn State with a losing record was projected in the field but knowing that losing record teams most likely will not be selected, Seton Hall was placed as the next best option and were selected over Creighton by virtue of its better late season mark within the Big East Conference. The High Major conferences, however, have two additional teams from the American Athletic Conference (Cincinnati & UCF) to join champion Houston. And the West Coast Conference added one additional team (Gonzaga) to join champion St. Mary’s.